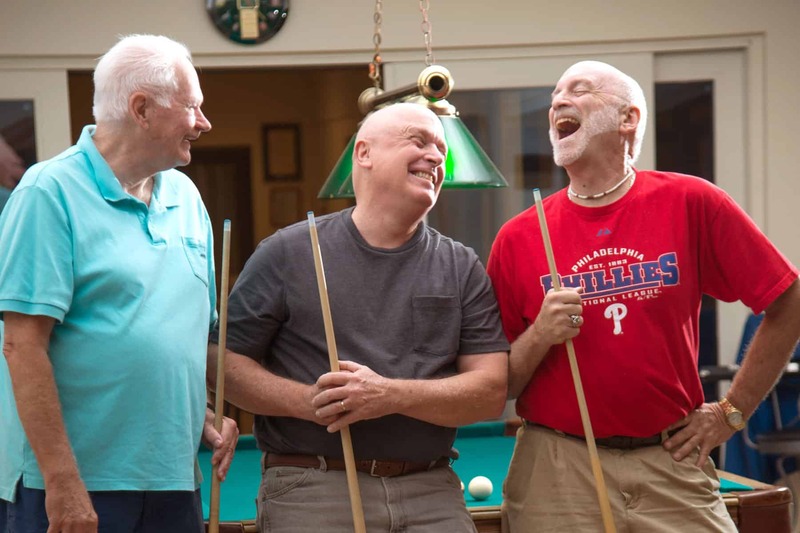 A game of billiards among friends is a great way to spend an afternoon at the Venice Friendship Center, where players hone their skills and work on their hand-eye coordination. The Venice Friendship Centers has a broad range of services, including one of the liveliest senior centers to be found in Southwest Florida. Check out Services for details about all of our programs. At The Caregiving Place Venice, we offer a licensed day program featuring supervised, engaging activities for seniors with cognitive or medical issues. It’s an inviting place to socialize with others, sharpen cognitive skills, reduce frustration, enjoy healthy meals, and feel valued. Find out more at Caregiving. The Caregiving Place Venice offers a wealth of resources for caregivers, many of whom are depleted from the 24-7 task of taking care of a loved one. At our Caregiver Resource Center, we can help you decide the best plan for you and your family and offer tools to support you on your caregiving journey. We also have support groups where you can ask questions, voice concerns and get new ideas from others. Find out more at Caregiving. The Venice Friendship Center offers an exciting array of interesting classes, from art and music to technology and life history writing. You can even suggest a class you’d like to attend! Guest speakers offer programs on topics of special interest to seniors. Find out more at Learning. If you are having difficulty managing on your own in your home, we may be able to help. Our case managers can arrange for special services such as personal aides and housekeeping, as well as crisis intervention in some cases. We also have a volunteer program called Friendship at Home that pairs isolated seniors with friendly visitors. To access these services, call the Elder Helpline at 866.413.5337 or call 941.955.2122. We also offer one-on-one help with accessing Federal assistance programs such as Medicaid and Food Stamps, free one-time legal consultation with an attorney, and tax preparation through a partnership with AARP. We are proud to participate in SHINE (Serving Health Insurance Needs of Elders), a program where specially trained volunteers provide Medicare counseling by appointment (through the Florida Department of Elder Affairs and Area Agency on Aging for Southwest Florida). Find out more at Resources for Aging. A healthy body is truly the key to a long life. That’s why our activity centers are dedicated to making sure that older adults maintain strong bodies as they age. Balance movement and Yoga are among our most popular classes. Other fitness classes include Silver Sneakers, Rhythm & Moves, Tai Chi, self-healing and Senior Friendly Aerobics. Find out more at Exercise. Volunteer retired physicians, dentists, nurse practitioners, physician’s assistants, nurses and clinic aides provide life-saving care to persons 50 and older who meet certain financial criteria. Many individuals come to the Pat Buster Health Clinic in crisis, without health insurance, and we are able to return them to wellness – in some cases, saving lives. Find out more at Health Clinics. Enjoy a meal in a friendly social setting for the 60+ crowd at our Venice Friendship Café. We can also arrange for the delivery of nutritious meals to isolated seniors through our Friendship Home Delivered Meals program. Find out more at Nutrition & Dining. Our vibrant, light-filled Friendship Center is a place to get connected, make new friends, listen to great music and have fun. Regular activities include games, puzzles, crafts, sing-along, health screenings and dancing to Big Band music. Find out more at Activity Centers. Our success is built on a network of volunteers who share our belief in the value of “people helping people.” Volunteers are greeters, teachers, physicians, dance instructors, technology experts, musicians, office assistants and more. Our volunteers receive as much as they give. They are part of a continuum of compassion that extends beyond just one person — to our neighbors, our community and the world. To find out how you can make a difference, visit our Volunteer section.